Don’t worry, they’re working on her movie next. Set during The New Batman/Superman Adventures (you can tell by Batgirl’s outfit and Ivy’s paler complexion), Barbara’s Christmas shopping is interrupted by Harley Quinn trying to reach the Batsignal, but this time she’s calling for help. Kit Nozawa is forming a team of female villains and wants Poison Ivy on her team. However, recruiting her by throwing Harley out the window was kind of a dumb idea and she’s refusing. Kit’s hacker is trying to break into Ivy’s laptop but Harley convinces Batgirl to help by offering to be arrested right after. Batgirl manages to take out her goons and sees through one of Kit’s holographic illusions to take her down while Harley releases Ivy. Batgirl takes Harley in…only she’s actually out because Arkham gave her a clean bill of health. Ivy’s still at large though. It looks like Commissioner Gordon is wasting his time waiting for Barbara. What they got right: Look, I rarely ship anyone, especially gay relationships between straight characters. And even I see the Harley/Ivy connection, which Dini hints the daylights out of. Also we learn Harley’s Jewish…although this is Harley so maybe talking about getting something on Hanukkah is just her being silly. The best part outside of seeing the female characters get some spotlight is the return of Kit Nozawa, one of the first villains we saw Batman fight on the original Batman: The Animated Series. (I think it was the first episode I saw.) She’s actually an interesting villain and I’m disappointed she never showed up again in any of the DCAU Bat-shows, so it was nice seeing her again, even if this is probably her last appearance anywhere. What they got wrong: You mean to tell me that will all the mayhem she caused, including causing a car accident that almost got a mother and son killed, nobody called it into the police? 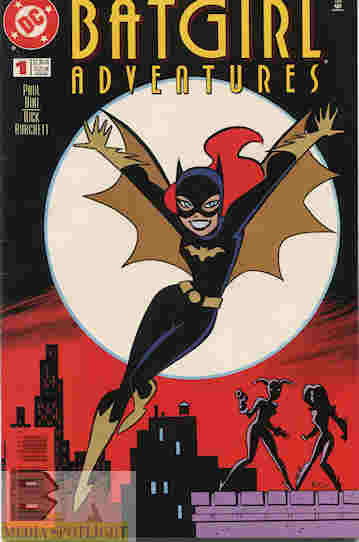 Recommendation: This is a good Batgirl story whether you’re into the DCAU or not. Pick this up while you can. It’s not a Christmas special since there’s no actual reason for this to be set around that time, but it’s still a good story. Posted by ShadowWing Tronix on June 17, 2017 in Animation Spotlight, DC Spotlight, Television Spotlight, Yesterday's Comics and tagged Barbara Gordon, Batgirl, Commissioner Gordon, DC animated universe, DCAU, Harley Quinn, Kit Nozawa, Poison Ivy, The New Batman/Superman Adventures. It’s been too long since I’ve seen the show, so I might have gotten Kit and Red Claw confused…somehow. Red Claw does show up a couple of time in the tie-in comics though and I wish she had been used more than once on the show. Thanks for catching that.